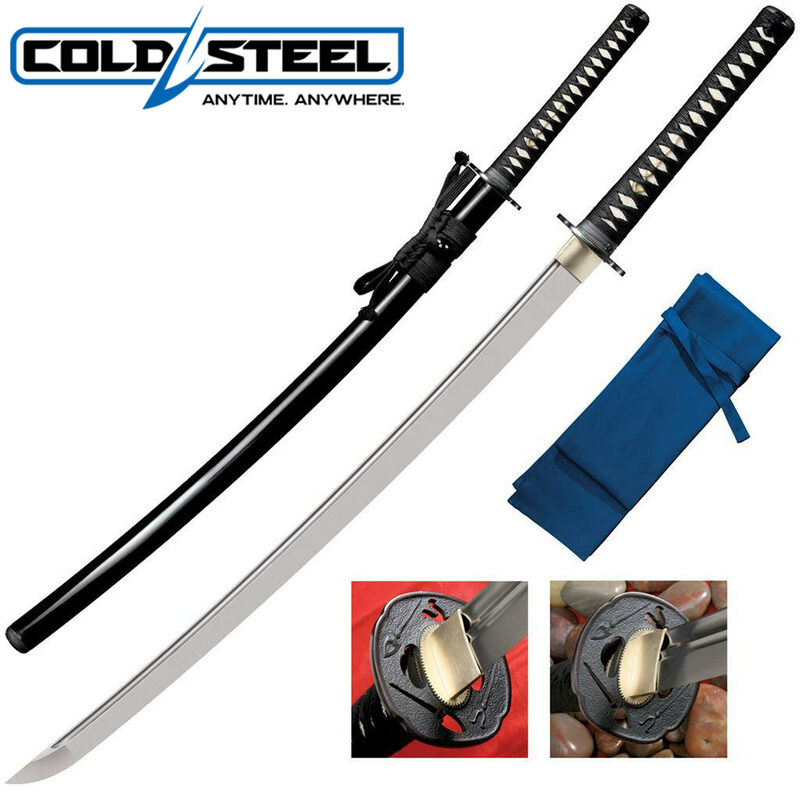 Cold Steel Warrior Katana Sword | BUDK.com - Knives & Swords At The Lowest Prices! This is a sword that offers the best quality and price that other models simply cannot match! Measuring 40 1/2", this katana features a 29 1/4" blade constructed from 1055 carbon steel. The ray skin covered handle is traditionally wrapped with black braid cord and offers eye catching brass menuki. This katana includes a black lacquered wood sheath and blue violet cover bag. You will not find a sword of this caliber and at this price anywhere! Cold Steel, 88BKW. One of my first swords. I bought one of these years ago and it was one of my first katana if not the first. Hard to remember if it was my first one. Anyways, it is built tough and strong. 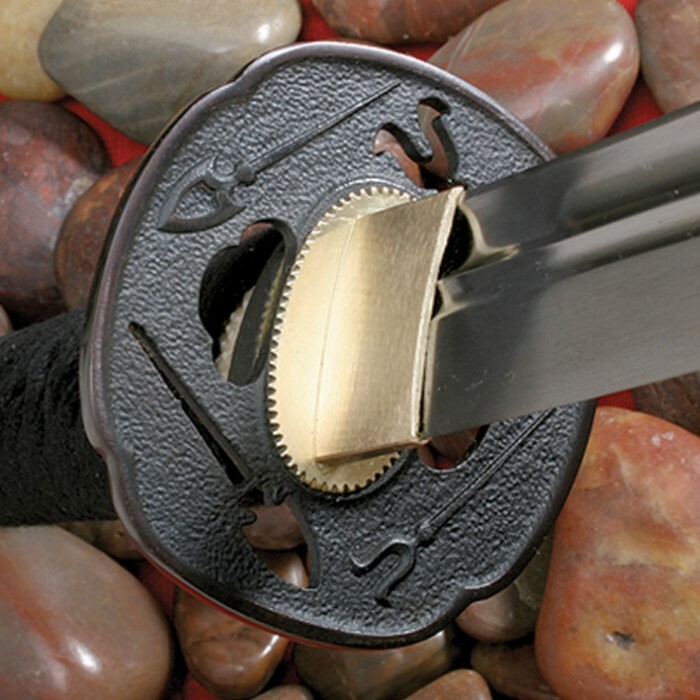 Cold steel tempers there swords until they have a spring like temper giving them great flexibility to prevent breakage. Sword is well worth the price. Other swords made strong for cheaper price will get bends from hard hitting. Cold steels flexibility stops it from having bends. I haven't cut anything with this sword yet but it is an amazing looking sword! The sword is heavier than my other katana and made so much better with a much thicker blade! It's well balanced and on the edge of being razor shard or sharp enough to shave with. The sword is everything the description says it is and more. All around amazing and beautiful sword. Totally worth the price tag. This Cold Steel blade is amazing, stunning and extremely durable. Check out csknives on YouTube, find the "Warriors Cold Steel Katana" video, it proves just how strong the blade is and how sharp it is. It would fit any situation, maybe an apocalypse (zombie apocalypse of course), this thing will slash and dice zombie after zombie, after zombie, after zombie, after zombie, after zombie. I extremely recommend this to anyone looking forward to the apocalypse. Cold steel did a good job with this katana, which is exceptional example of a practical use weapon without have to pay a pre-$1000 cost. It will never replace a weapon made by a Japanese Master, but most are not looking for that kind of quality. Overall workmanship is excellent, and all fittings are tight (almost too tight). Things not to do: "I just took it out to trim my tree in the back yard unlike most buyers i use my blades and it did a real good job going through 2" to 2.5" of solid wood." This is not what this type of sword was designed for in any respect, nor the proper stance, training, or form. People like this should be drug out into the street and shot. This is a great sword!! You could literally chop a tree down with it and the blade will be fine. Cold steel makes blades for heavy cutting: (not for tree cutting but it can if you like.). Hanwai is also another great brand name. Sure you pay more for theses two brands but I guarantee the swords will last you much longer then cheaper swords. Its worth paying the extra price. Very well made. Thumbs up for True Swords customer service. I wish all companies were this good. Fastestest shipping time, like less than a hour after ordering. Ordered this sword with extremely high expectations, when I unboxed it it wasn't very sharp at all, except for the tip area. Other than the lack of a razor edge though it was extremely tight and I mean tight, it feels like you could chop through a car hood, wait they did that in the "proof video" already, lol. Anyway, it feels very good, it is heavier than most katanas I have owned but in a way it's a good thing, it's not too heavy as to unbalance it (as some people say). 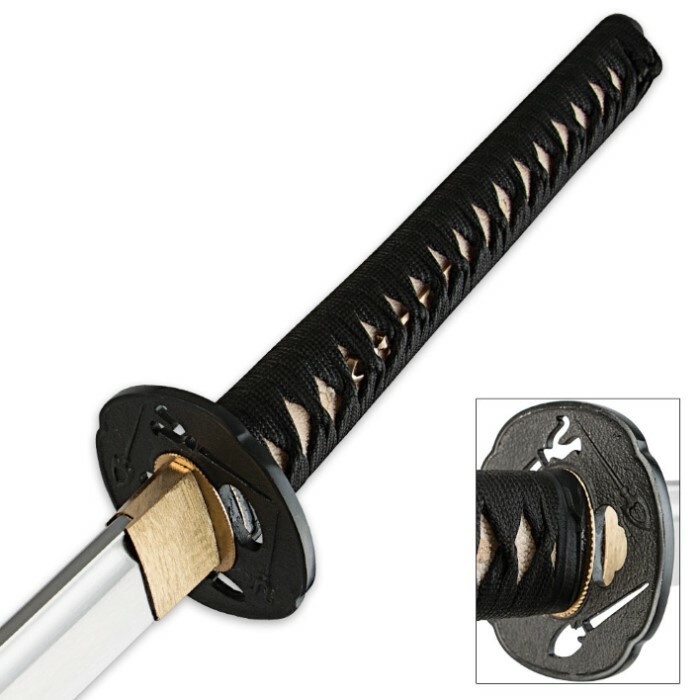 I like how Cold Steel did their own customizing to the handle and tsuba and not just the stereotypical decorative crap ya usually see on swords. So as for the sharpness, it didn't take me long to put a razor edge on it, and I do mean razor, after I was done I ran it down my forearm...not very smart since it shaved a big line of hair off my arm. My fiancee was watching me and yelled at me, lol. Even though it shaved me that well, I wanted it even sharper, so a little more honing, next test was my left leg, upon running it down my leg it actually broke my skin! Wow! So yeah, I think it's sharp enough now, lol. Awesome sword, awesome service and awesome shipping speed, literally next day it was in my hands. Good job Cold Steel, and good job Trueswords.com. BTW I did kind of pitch a hissy fit to customer service on here for it not being razor sharp out of the box and I was given a 20.00 refund for my incoveniance, that's what I call customer service. Trueswords.com all the way baby! The sword is a piece of cold steel art!!! Great price , razor Sharp,and definitely battle ready. Trueswords as always you have the best prices and customer service. I would recommend this sword to any sword enthusiast.